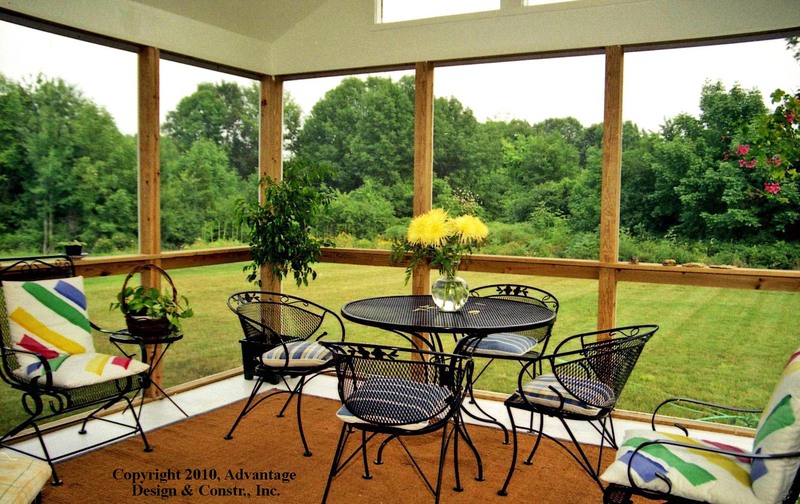 So you want a sunroom? Sure, lots of glass, lots of sun, lots of fun. 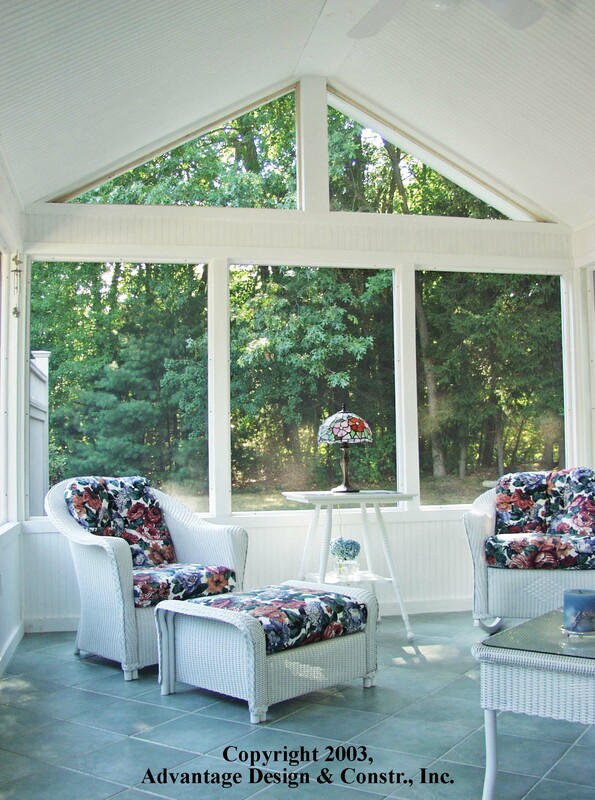 But just what makes a sunroom? What makes it so enticing? 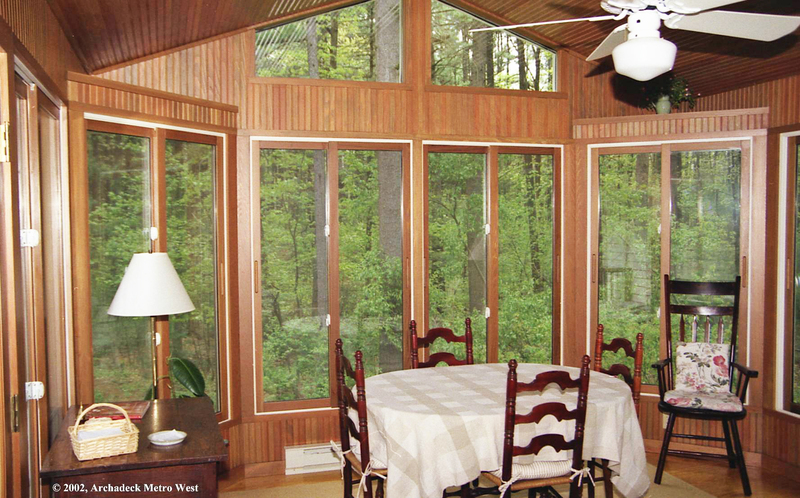 To understand sunrooms, we need to start with their older sisters: porches. Porches are all about fresh air, cool breezes, and barefoot summer days. Relax with iced tea in its shade on a hot day. Cook in the kitchen, but eat with your family — on the porch. Escape the nighttime summer heat by sleeping on your porch. Open porches, screened porches, front porches – porches are part of your yard, brought into your house. A porch brings the outside in. A Sunroom brings the inside out. It brings your warm comfortable living room into the backyard, into the sunlight. Big windows on all sides flood the room with pastoral views — lawns, flowers, woods, meadows. You’re in the backyard on a cold February day, enjoying nature, but you’re comfortably warm. So what are the keys to designing such a space? ♦ Light. Lots of light – and lots of light means lots of glass. 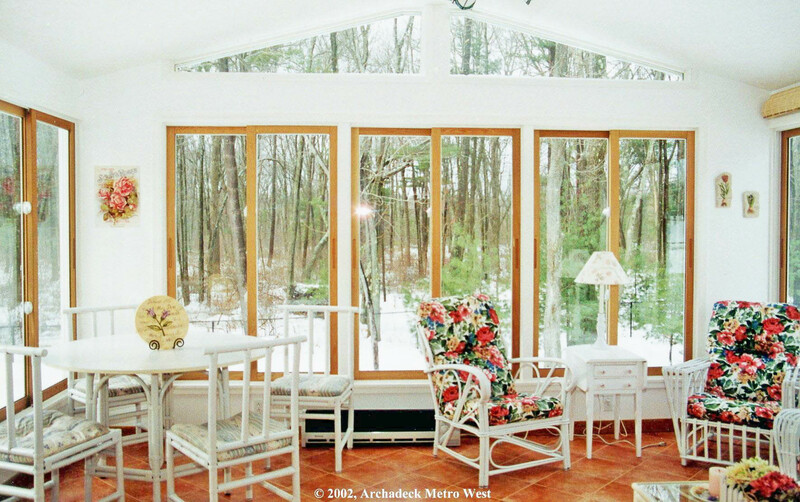 A sunroom should feel unique, so the windows must be large – wide and tall. Windows everywhere; windows in all the walls, windows even in the roof – skylights. Fixed or opening skylights, the difference is unimportant; what is important is the additional light they provide. Better still, add gable glass. Glass in the gable end brings in more light, brings in larger views, and it also extends the height of the room. ♦ Space. A sunroom needs lots of space, so make it 12’x16’ or 14’x16’, or larger if you can. Vertical space is also critical, and that means a tall ceiling. Or, better, no ceiling. A cathedral ceiling follows the roof lines; it is created by eliminating the customary flat ceiling and attaching ceiling materials directly to the sloping roof rafters. ♦ Special Feeling. 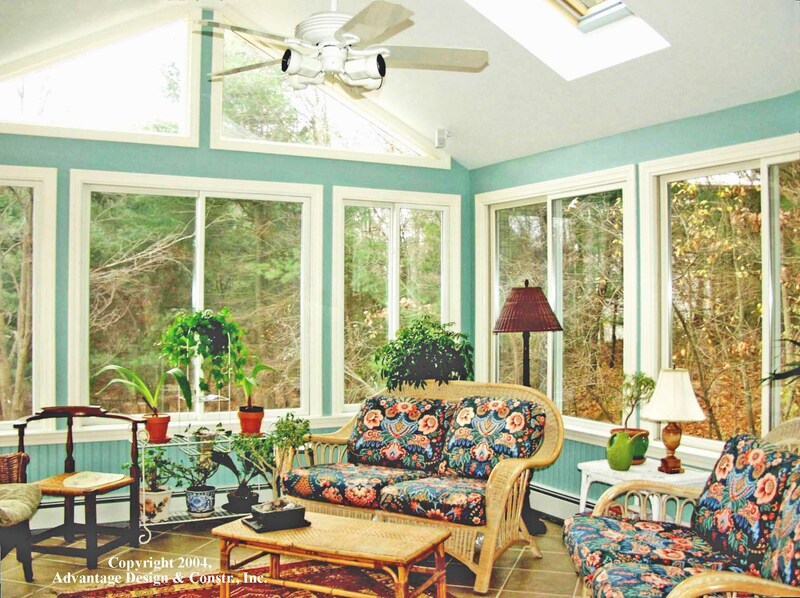 To be so inviting and special, a sunroom must have a different feel. The large windows and tall ceiling redefine the space, and sunroom details should further differentiate it from the other rooms. The windows should not be ordinary, double hung windows. They should be sliding windows — sliding windows that start low to the floor and rise high, so their vertical lines accentuate the room’s height. And the windows should be close together, so the windows are the walls. Transparent walls eliminate the enclosed feeling and pull the sunroom into the yard. A sunroom is part of your house. It is insulated and usually heated; and it has a finished interior floor and finished trim. Put all that together – light, space, heat and a unique feeling – and you have a special room to enjoy in all seasons. At Advantage Design & Construction, we offer professional design and build services for clients west and north of Boston. Over the past 21 years we have designed and built over 800 projects, including more than 200 porches and sunrooms. 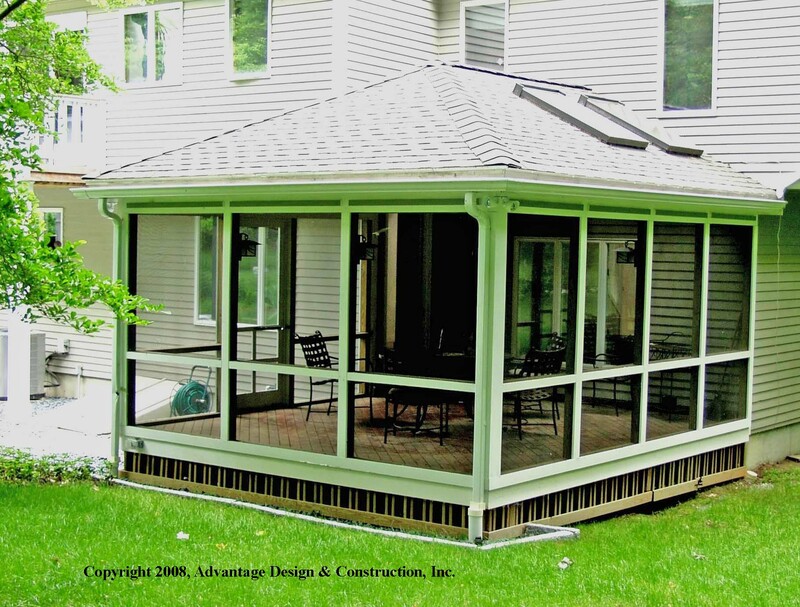 We have enhanced the depth of our expertise by limiting our work to decks, porches, and sunrooms. To view some of these projects, visit our website. To learn how we treat our clients, check us on Angie’s List or read a recent article about us in Remodeling Magazine. For a free design consultation and a relaxed and rewarding experience, contact us via e-mail, subboston@archadeck.net or by phone, 781-273-3500. NextIs your deck ready for Winter?